We are going to start on the Mediterranean diet here and I am excited to try some new dishes. 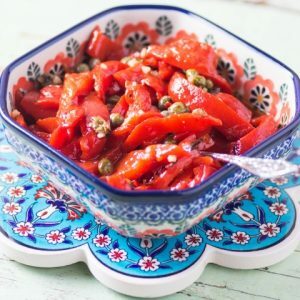 These Marinated Roasted Red Peppers are perfect for a tapas dish, or an appetizer or as a side! They are so easy to make using a jar of roasted red peppers. They literally take minutes to pull together and pack a lot of flavor. We had some the other night with Spanish Spice-Rubbed Chicken Thighs! Another delightful dish but that one does require a bit more work! I served the peppers as a side but also they were wonderful on a slice of sour dough bread! These peppers would be perfect on a crostini as an appetizer also!! Colorful, flavorful and so easy! This recipe has it all! I will be making this one again and again!! 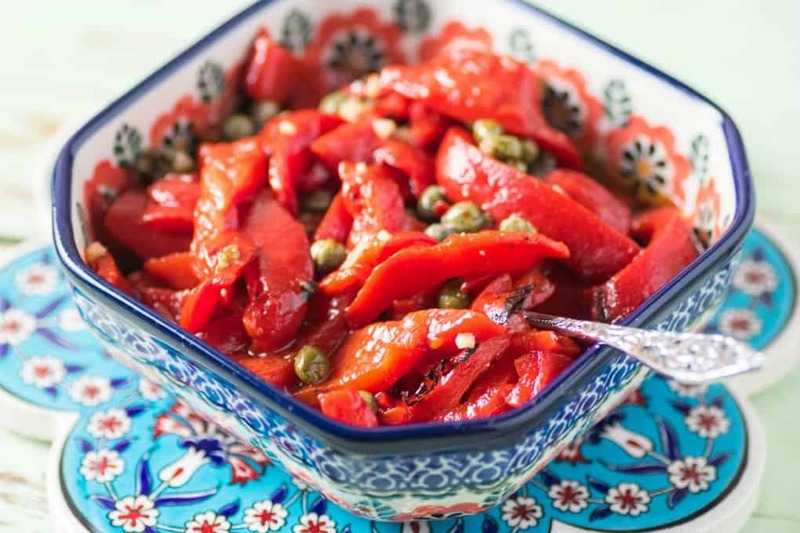 I love the briny, tangy, pickle taste of capers with the smooth buttery sweet peppers. Just the right hint of garlic, olive oil and balsamic vinegar too. In a dish like this one I use a very good olive oil, but you don’t need much, I only used 1 Tbsp. You can roast your own peppers but for simplicity I just used a jar of peppers. 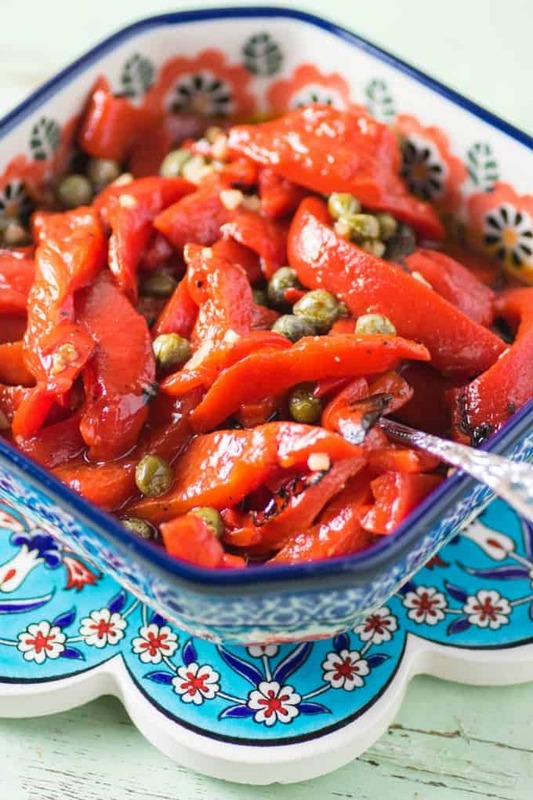 Capers and sweet red peppers are a mainstay in Mediterranean diets. I love the philosophy behind the Mediterranean diet. Food still has lots of excitement. This is not a boring diet plan but rather a healthy way to eating. It also includes a couple of glasses of red wine a day. Heck, I can participate in that! I have to tell you that I just got this gorgeous bowl in a little Polish store in Pike Place on our recent trip to Seattle. They had some divine pieces. The stunning trivet underneath was given to me by my best friend Nan. It is from Turkey and just so beautiful. Serve these peppers up in your favorite dish!! These gorgeous Marinated Roasted Red Peppers are the perfect side dish in a Mediterranean meal or they make a stunning appetizer!! Slice the peppers into long strips and then cut in half. Place them in a small bowl and top with the other ingredients. Stir well. Place in a decorative bowl if desired and cover. Refrigerate if made ahead but warm up to room temperature to serve. Those look absolutely mouthwatering. I love finding new ways to make veggies tasty and fun. Thanks so much for this great recipe. I love peppers anyway I can get them so I know this one will be a hot with me! This looks AH-MAZING!! I love the idea of marinading them! SUCH a good idea! Those look really good. I love having peppers. My whole family loves them too, so it’s nice to be able to make something like this. I roast them all the time for my wife since she loves them. Never thought about marinading them first. Have to try this! I love anything roasted. Well, except meat. I’m vegan which in my eyes makes your red peppers all the more delicious. Your recipe is perfect for my family!! 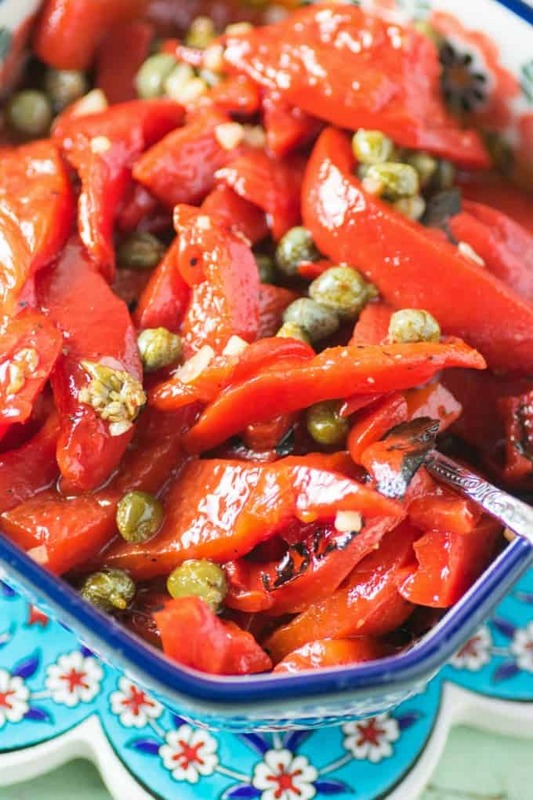 These marinated roasted red peppers look so delicious and easy to make. I will have to get the ingredients I need to make some this weekend. Those look sooooo good. I love having peppers. My whole family loves them too, so it’s nice to be able to make and know every body will love!